This is an article that was in the Waterloo/Cedar Falls Courier on September 28th written by Jon Ericson. CEDAR FALLS- Spinutech stays green by reducing the amount of black and white it tosses out. The Cedar Falls Web firm has a green philosophy ingrained throughout the company. The fact that the company is so computer-oriented helps keep it from producing too much in the form of waste. "What we try to do, with the nature of our business, a lot of things are electronic to start with," said Spinutech partner Adam Lewis. The green theory starts before Spinutech employees produce anything. "We ask people to think before they print," Lewis said. Most of their work is done electronically, and Lewis said they don't have a need for much paper. Much of what they do have in the form of paper comes in their physical inboxes as junk mail. A number of recycling bins are set up throughout the office for employees to dump unwanted paper products. "We try to set up an environment where those kind of practices are encouraged," Lewis said. Lewis said recycling doesn't take much encouragement from management, as most of their youthful workforce is inclined to recycle before they ever step foot in the office. "We have people who volunteer to take (paper) to the recycling center. They would be going anyway so they just load it n their cars and take it in," Lewis said. The company doesn't contract with anyone to do their recycling, the employees take care of it on their own. 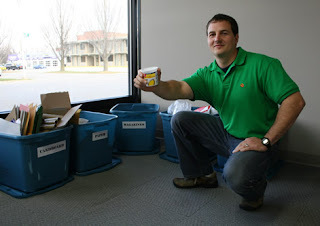 In addition to the paper bins, Spinutech employees find convenient recycling options for cardboard boxes from the lunches they bring to work. The company's low-waste principals also extend to their client base. When the company sets up an account they ask clients to use electronic invoices rather than paper versions. "Some people opt not to because internally they need to have a paper copy. They'd rather have us print it than get an electronic copy and print it themselves," Lewis said. "We have others who say they get enough e-mail the way it is, so they prefer a printed version." But those companies who get their invoices by mail are in the minority. About 80 percent of Spinutech's clients receive invoices electronically.